"An organized resistance movement that uses subversion, sabotage, and armed conflict to achieve its aims. Insurgencies normally seek to overthrow the existing social order and reallocate power within the country. They may also seek to (1) Overthrow an established government without a follow-on social revolution. (2) Establish an autonomous national territory within the borders of a state [Separatists]. (3) Cause the withdrawal of an occupying power [Freedom Fighters]. (4) Extract political concessions that are unattainable through less violent means [Revolutionaries]." "Stated another way, an insurgency is an organized, protracted politico-military struggle designed to weaken the control and legitimacy of an established government, occupying power, or other political authority while increasing insurgent control." "Doctrinally, guerrillas are the 'overt military aspect of the insurgency.' They exist alongside their counterparts, the auxiliary and the underground." 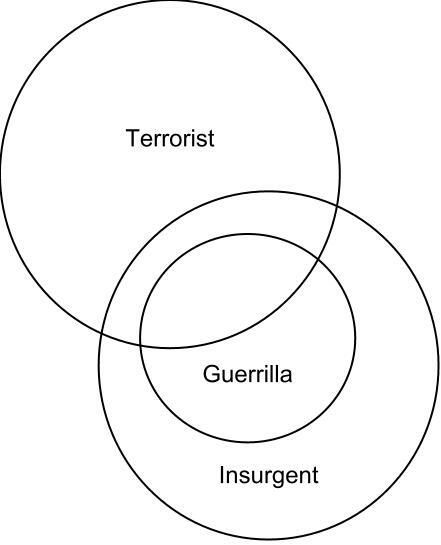 In other words, guerrillas are the violent force of an insurgent or terrorist organization. US Department of Defense US Military Academy training manual Insurgents vs. Guerrillas vs. Terrorists, http://usiraq.procon.org/sourcefiles/InsurgentsvsTerrorists.pdf, Paragraph 4.